Grief. That big loaded word that can bring so much out us. Even making us think that we are losing our minds while we are going through the process. I am writing about this because a couple of weeks ago, I came across this. 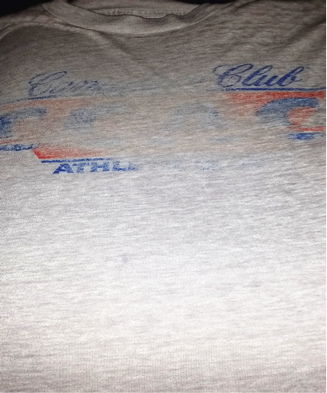 To anyone else, it looks like an old, faded t-shirt. This is a truth. But also, this is an old shirt that my late father owned. He died over 15 years ago; one of the few keepsakes that own to this day. I had forgotten about this shirt until I came across it in the closet one day. A flooding of emotions came to me. What I came to realize that I was experiencing grief, even though my father passed years ago. Grief is one of those things that we all experience throughout our lives. The loss can be physical, symbolic, or a combination of the two. For me, seeing this t-shirt was a representation of the physical loss of my father and the symbolic loss of what could have been a deeper relationship between the two of us, if things in life were different. I am lucky to have the relationship and reconciliation we had the year before he died. Whenever grief is talked about, it is discussed as 5 stages. These stages are denial, anger, bargaining, depression, and acceptance. 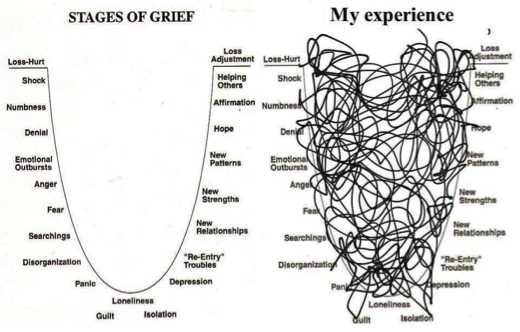 The actuality of grief is not experienced in a stair-step or a linear fashion. It actually looks something like this. While the grief process can be overwhelming and chaotic, the 8 limbs of yoga can assist in helping someone. As the person is moving more towards acceptance of the loss, there is an intention towards healing that needs to be created. Yoga helps to create a ritual of surrendering, understanding what occurred, process the loss, and a new reality of who you are as a human being. Therapeutic and accessible yoga helps to form these intentions; uniting aspects of the self through the Panchamaya kosha model. Daily and weekly practices of yoga creates ritual for the person; something that the individual can “come back home to.” Yoga also assists in the ability to connect to something outside of the pain and grief that occurs. Providing a time of support, change, peace, protecting one’s self from the chaos of grief, and spiritual awakening. Yoga sequences can be of a shorter sequence, due to what the person is dealing with. You do not want to overwhelm the person more than what s/he is dealing with right now. Various asanas can challenge the person without pushing yourself harshly such as standing and balancing poses, gentler inversions, forward folds, backbends, and restorative poses (to name a few). Pranayama practices can include simple breath awareness; utilizing the breath as an anchor. The breath should never be pushed or forced. Other breathing practices can include diaphragmatic breathing, the 3-part breath, and ujjayi breathing (to help create energy into the person’s body/mind). The practice of meditation helps the individual to work with thoughts and emotions stemming from grief from the perspective of non-judgment. The aspect of witness consciousness and bhavana practices centered around the heart can help to ease the pain of grief. From this place, the person can feel like s/he has control over his/her life and happiness by shifting the relationship to the thoughts and emotions that are coming up. This can create the intention of self-compassion. So what did I do after I came across my late father’s shirt? I let whatever emotions and thoughts come up, being present to what is going on from a place of non-judgment and compassion. 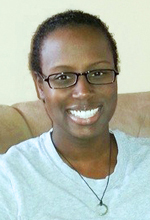 Jennifer (Jenn) Del Castillo is a licensed professional counselor and yoga therapist. 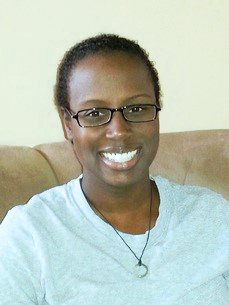 She provides a variety of integrative services including counseling and yoga therapy to the metro Atlanta area community and online. Excellent information! Thank you for sharing your knowledge! Previous story Vital Vagus: What is the vagus nerve and what does it do?